Burj Al Arab of Jumeirah, the icon of Dubai and one of the most expensive and luxurious hotels in the world, now affords an even more glittering spectacle in the night sky. The exchange and programming of the new high-tech lighting system was performed by local partner A&O Technology. Every evening, the Burj Al Arab offers a colourful light show. The changing hues and brilliant strobe effects enthuse millions of visitors to Dubai every year. 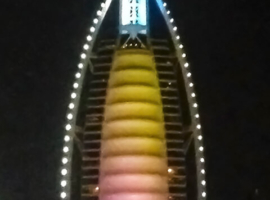 The new strobe effects that frame the sail-shaped building are the highlight of the current light show at the Burj Al Arab. For the modernisation of the strobe lighting system, the hotel’s management relied on the experience and expertise of A&O Technology. 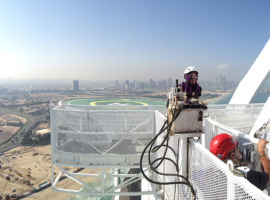 A&O Technology employed climbers to complete the installation on the exoskeleton of the 321-metre-high building. 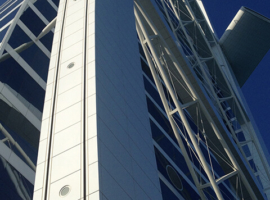 The materials as well as the control and programming were also supplied by the Abu-Dhabi-based lighting company. The new pure-white strobe lights employ state-of-the-art LED technology that assures considerably lower maintenance costs and energy consumption as well as a longer service life. For the operator, the new LED strobes offer an energy saving of up to 85% over their predecessors. The new strobes were integrated separately into the existing light system. They are controlled via DMX and programmed in advance to suit the rest of the evening light show. Thanks to their heat management, the LED-based strobes can perform extended hyper flash sequences (sustained strobe). The cooling phase still required by the legacy system results in blackouts during hyper flash sequences. The new system does not suffer from this problem, so the hotel can offer longer as well as better strobe displays. Furthermore, this advantage allows the programming of more elaborate and interesting strobe sequences.